NOTE: Corneal Transplants and Lens Implants used during cataract surgery are often confused by the general public. Implants are used to replace the cloudy lens during cataract surgery. Corneal Transplants treat a different part of the eye, are less commonly used, and treat diseases and scars of the cornea. A: The best vision after a cornea transplant usually requires 4 to 8 months and may continue to improve up to a year after surgery. Most patients will need a different glasses prescription after the surgery to achieve their best vision and some patients may need to wear hard or soft contact lenses to achieve their best vision. The prognosis for good vision after surgery varies with the disease for which the transplant was performed. The most common indications for a cornea transplant have an 80-90% success rate. Even if the surgery is successful, other existing eye conditions (such as diabetes, macular degeneration, cataracts, and glaucoma) may limit vision after surgery. Q: What are some of the common corneal diseases that affect the cornea? Corneal Edema: This is the most common reason to need a cornea transplant. The back layer of cells on the cornea (called the endothelium) normally continuously pump water out of the cornea to keep the cornea tightly packed and to allow light to pass through it undisturbed. These cells do not regenerate and slowly die off during a person’s life. If a person loses too many of these cells when they get older, the cornea will accumulate too much fluid and become cloudy. Keratoconus: The normal cornea has a shape similar to the front portion of a sphere. However, some people in young adulthood develop a progressive thinning of the cornea that causes the cornea to develop an irregular shape. This is a slowly progressive disease, and as the cornea’s shape become more irregular, light rays that enter it are scattered and are not focused correctly on to the retina in the back of the eye. Initially, glasses or contact lenses may be able to correct the distortion, and some people with keratoconus may never need surgery. However, other patients’ corneas may become increasingly irregular or scarred to the point that even hard contact lenses will not allow them to see well. 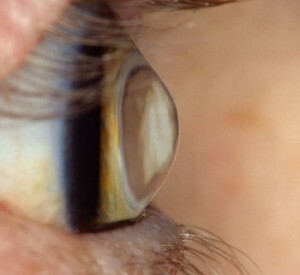 Corneal Scarring: Just like scar tissue can form on a person’s skin, scar tissue can also form on the cornea. It most commonly occurs after an infection or trauma. The most common infections that lead to scar tissue are bacterial infections (often after contact lens related corneal ulcers) or virus infections (such as the herpes or zoster viruses). 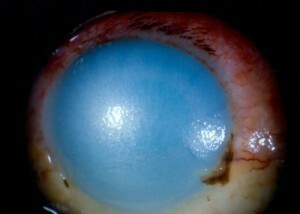 Severe chemical burns may also cause extensive corneal scarring. Corneal Dystrophies: These are abnormalities of specific layers of the cornea that can result in corneal scarring or swelling. Some dystrophies are inherited, but others may develop from new mutations and may not be inherited. Some dystrophies may result in corneal problems in childhood and others may not manifest until later in life. The most common dystrophy requiring a corneal transplant is Fuchs’ dystrophy, which typically results in corneal swelling that develops later in life. Failed Graft:Some people who have had a cornea transplant in the past may reject the donor tissue or the tissue may fail by itself after many years. These patients can usually undergo a repeat cornea transplant, although the success rate is not as high as after the first transplant. 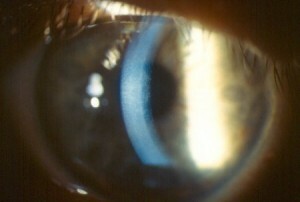 Photo of a Corneal Transplant with very mild graft rejection (see the white dots just below the center of the pupil and redness of the eye). The graft will likely not need to be replaced in this case–just treated with drops. Q: What are the reasons to have a cornea transplant? A: If the cornea is swollen, scarred, or irregular, this can cause the cornea to scatter or distort incoming light and result in blurry vision. Also, some corneas that are swollen may cause a significant amount of pain and discomfort. A cornea transplant should be considered if vision cannot be corrected satisfactorily with glasses or contact lenses, or if painful swelling cannot be relieved by medications. In the United States, approximately 30,000-35,000 cornea transplants are performed each year. Of all types of transplant surgery done today, corneal transplants are the most common and successful. A: With any type of eye surgery, there is always a risk of bleeding and infection, so it is important to use the antibiotic eye drops as prescribed. Corneal transplants may be rejected 5-30% of the time because the corneal tissue is foreign to the patient – however, most rejection episodes can be treated successfully with eye drops. Rejection is less of a problem after corneal transplantation than with other organ transplants because the cornea is normally without blood vessels. The signs of rejection include redness, pain, light sensitivity, and blurry vision. If any of these symptoms occur, they should be reported immediately. Other possible complications include elevated eye pressure, swelling or detachment of the retina, and persistent eye inflammation. The cornea never completely recovers its original strength after surgery and patients must be careful to avoid trauma to their eyes after surgery indefinitely. All of these complications can be treated, and a cornea transplant may be repeated if necessary. Q: What happens if you decide to have a cornea transplant? A: Before surgery: Once you decide to proceed with the surgery, your name is put on a waiting list at a local Eye Bank – usually the wait for a donor cornea is not very long. Before a cornea is released for transplantation, it is inspected for clarity and the eye bank tests the tissue for different viruses, such as the viruses that cause hepatitis and HIV. If you are taking any blood thinners (such as coumadin, plavix, or aspirin), you may need to stop these medications for a few days before the surgery if it is OK with your primary care doctor. You will be asked not to eat or drink anything for 8 hours before your surgery. The Day of surgery: The surgery is done on an outpatient basis, which means you will be able to go home on the same afternoon of the surgery. Once you arrive at the surgery center, you will be given some eye drops and will be given a sedative to help you relax. You will also be given some medicine to numb up the eye so that you will not feel any pain. The operation: Your eyelids will be gently kept open with a lid speculum, so you will not need to worry about blinking or keeping your eyes open. The center of the diseased cornea is carefully removed and any additional work (such as removal of a cataract) is completed, and then the clear, donor cornea is sewn into place. A microscope is used to perform the surgery and the operation takes about 1-2 hours. 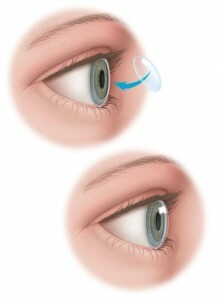 Drawing that shows steps of a full thickness corneal transplant. After the disease cornea is removed-the donor cornea is put into place. After the operation: A patch and shield will be placed over your eye and you will be allowed to go home after a short stay in the recovery unit. You will need someone to drive you home after the surgery, but once you get home, you will be allowed to eat and perform most activities. You will be able to watch TV and read from your other eye as your operated eye recovers from the surgery. You will come in for a follow-up appointment the day after the surgery. We will ask you to be careful not to rub or get anything in your eye and to use your eye drops as prescribed. Q: What is the cornea and why does it affect my vision? A: The cornea is the clear portion of the front of the eye that covers the colored iris and dark pupil. It allows light to pass into the eye and helps to focus the light on to the retina (or the film of the eye). There are many corneal diseases that can affect the clarity and shape of the cornea, which can result in a partial or total loss of vision. When the cornea is cloudy, it is similar to looking through a dirty window. Q: What is the sutureless corneal endothelial transplant (DSAEK)? A: DSAEK (Descemet’s Stripping Automated Endothelial Keratoplasty) is a new procedure, where only the back portion of the central cornea is transplanted, rather than the entire central cornea. This technique may be offered to you if your corneal problem is due to a dysfunction of your corneal endothelial cells (the back layer of the cornea). This procedure is done in a different way from a conventional cornea transplant and requires much less suturing. It’s major advantage is that it typically allows for a more rapid visual recovery and the risk of tissue rejection is also lower with this procedure. About half of the corneal transplants are done this way throughout the US. However, this procedure can only treat disease that occurs on the back portion of the cornea, so not everyone is a candidate for this newer procedure. This procedure is also done on an outpatient basis and your experience on the day of surgery will be similar to what is outlined above for a full corneal transplant. During the surgery, an air bubble is injected into the front portion of your eye to press the transplanted tissue into position. You will need to lay flat on your back in the recovery unit for one hour after the surgery to allow this process to occur. You will then be allowed to return home, but we will ask you to remain flat on your back as much as possible for the next 1-2 days until the air bubble dissolves away (though you will be permitted to sit up to eat and go to the bathroom). You will still need to be on steroid eye drops for at least a year after the surgery and you will still need to be followed closely after the surgery. DSAEK patients can often experience visual improvement within a few weeks of the surgery and this procedure can also be repeated if necessary. We will let you know if you are a candidate for this exciting new procedure when we examine you. Q: What medicines will I need to take after the surgery? A: Most patients are put on an antibiotic drop and a steroid eye drop after the surgery. Unlike other organ transplants, you will usually not need to be on any oral immunosuppressive medications – you will only be taking drops. You can usually stop the antibiotic drop after 1-2 weeks. The steroid drop will be gradually tapered down over the first year until you are on the drop just one time per day – you may need to remain on this drop one time per day for several years or possibly longer. Q: When will the stitches come out? A: The donor cornea is sewn into place at the time of the surgery. These stitches are thinner than a human hair, so they are not very noticeable by most people. Depending on the health of your eye and the rate of healing, some of these stitches may be removed after several months of healing. This removal is usually done right in the office, only take a few minutes, and does not hurt. Many of the stitches may be left in place and will gradually dissolve by themselves over many years. Please contact us for an appointment with Dr. Mahootchi or Dr. Chhabra at The Eye Clinic of Florida or if you have concerns about Corneal Disease and would like more information. Gorovoy, Mark S. “Sutureless Corneal Endothelial Transplant.” Patient Education Concepts Booklet, 2006. McNeill, James. 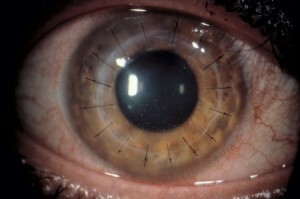 “Indication and Outcomes of Penetrating Keratoplasty.” Chapter 117, in Cornea, 2004. “Corneal Diseases and Surgery.” Wills Eye Hospital Patient Education Booklet, 2006.